We first got a glimpse of the 'Scarlett' dress when the Duchess of Cambridge wore it underneath her Jonathan Saunders coat during her visit to Scotland. We were able to get a complete look at the dress when Kate wore it again for her engagement at Blessed Sacrament School in London. 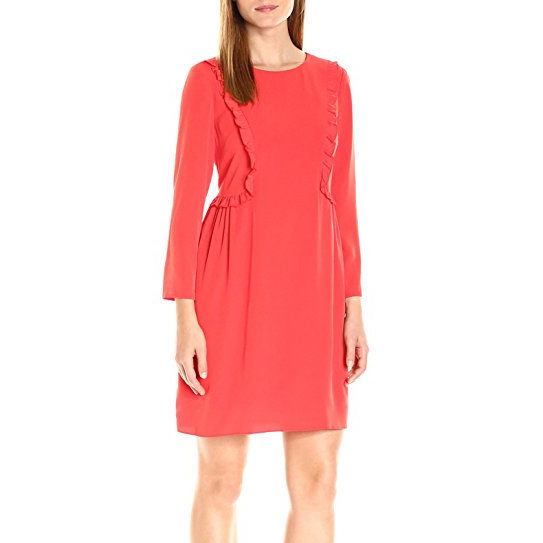 The Goat 'Scarlett' pleat front dress is rendered in a bold coral hue, classified as 'geranium' by Goat Fashion. The wool crepe dress is characterized by a pleated bust and defined waist with a matching belt. STYLE FILE: Goat Scarlett Pleat Front Dress as seen on Kate Middleton, Duchess of Cambridge.